The number one tool in the Six Sigma practitioner’s belt is the statistical analysis package. It’s the single most-used tool, and it’s critical to advancing the Six Sigma project from the M (measurement and characterization) phase through A and I (analysis and improvement) and getting you into the C (control) phase. During the Six Sigma project lifecycle, you transform a practical problem into a statistical problem, solve that problem, and then transform the statistical solution back to a practical one. The stats package is the enabler that takes you through that transformation. No self-described Six Sigma professional would be without one. Stats packages are complex and sophisticated technology tools that work wonders with numbers. They’re so capable and have so many features and functions that you risk losing yourself in them. Remember the goal of Six Sigma is process improvement. Avoid analysis-paralysis and know when to say when with your stats package. Over the years, practitioners created macros and add-ons specific to performing Six Sigma analysis for spreadsheet programs like Excel. They were — and sometimes still are — posted on dropboxes and e-mailed among members of the community. These offerings became so broadly used and useful that several firms emerged to bundle them up into add-on programs. You simply install one of these programs, and it supercharges your spreadsheet into a stats package. Programs such as SigmaXL, QETools, SPCforExcel, and StatTools integrate seamlessly with your spreadsheet program. In most cases, the integration enables your spreadsheet with new menu functions and toolbars. The programs also offer developer kits that let you build even more custom or specialized procedures. These packages are designed to work only with specific programs, such as Excel. Check with the vendor to ensure compatibility with your spreadsheet program of choice. You can use hundreds of established statistics packages as a Six Sigma practitioner. Most have their roots in university science or engineering programs, and many are open-source products that are the result of university projects. The commercial packages tend to be more general purpose, while the open-source packages are often slanted to some specific area of statistical analysis or field of application. As a rule, open-source software is typically written in a language that can be compiled and run on any platform. Conversely, many of the proprietary packages were designed for a single platform, although over time, most vendors support the more popular operating systems. Of the many stats packages available, several are Six Sigma-specific, organized and aligned with features specific to performing Six Sigma analyses. These packages often combine the analytics capabilities with features that support other phases of the DMAIC cycle, as well as project and process management tools. The point of all your Six Sigma analysis is to determine how best to improve a process so you can implement those improvements and then keep the improved process in control. For this reason, business process management (BPM) software helps connect the outcomes of analyses and visualization to systems of execution and control. In its 16th release as of this printing, Minitab is the leading provider of software for Six Sigma education as well as Six Sigma improvement projects; you find Minitab at the heart of analytics activity within most corporate Six Sigma programs. Minitab is a complete, full-featured statistical software package, including basic statistics, graphics, regression, ANOVA, DOE, SPC, MSA, multivariate analysis, nonparametrics, simulation, and more. It comes with online training, tutorials, and help and includes hundreds of sample data sets, report-generation, and a function to export to Word and PowerPoint. It’s available in seven languages; more than 4,000 universities use it to teach statistics. Minitab is strictly a Windows application. 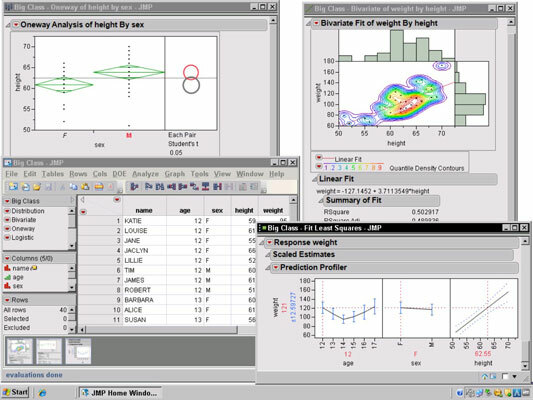 JMP is more than statistical analysis, and it has a particular emphasis on visualization. Beyond reports and static graphs, JMP enables a dynamic interaction with data — the ability to see patterns and spot trends in broad-based, complex data sets. JMP is enterprise-class software. JMP runs on Windows, Apple/OSX, and Linux environments and has both 32-bit and 64-bit editions. Now in its 10th release, JMP includes a family of products, including JMP Pro, with more advanced analytics, data mining, and predictive models. In addition, JMP has specialized products for clinical testing and genomics. Dozens more statistical analysis packages are on the market, both for general-purpose usage and for providing special functions for specific types of analysis. 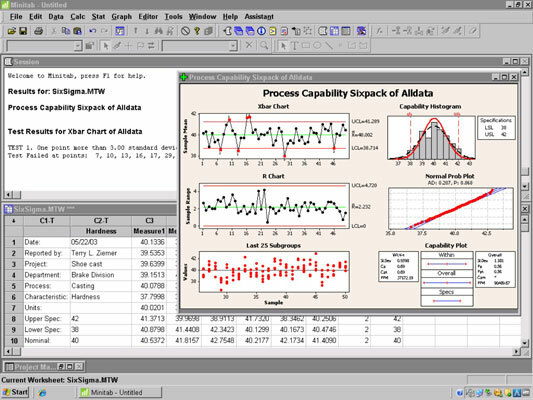 Some of the other analysis packages Six Sigma practitioners use are Statistica, Kronos, Statgraphics, Hertzler, and SigmaFlow.